I did not realize python-wavefile got more relevance than most of my github projects: Other people, not just me, are actually using it, and that’s cool. So I think I owe the project a blog entry… and maybe a logo. python-wavefile is a Python module to read and write audio files in a pythonic way. this week, I have come across a useful git extension. It git clones the content of a Mediawiki site as it were a git remote repository so that you can pull revisions into your hard drive, edit them and push them back into the wiki. My latest experiments involved animated SVG’s and webapps for mobile devices (FirefoxOS…). Also scratches HTML5 audio tag. The result is this irritating application: The Bla Face. A talking head that stares around, blinks and speaks the ‘bla’ language. Here you have a cute alternative to QJackCtl if you have it plenty of ardour multichannel ports connected in fancy ways. Auto-completion, broadcasting and Python slices on ports will be your friends. 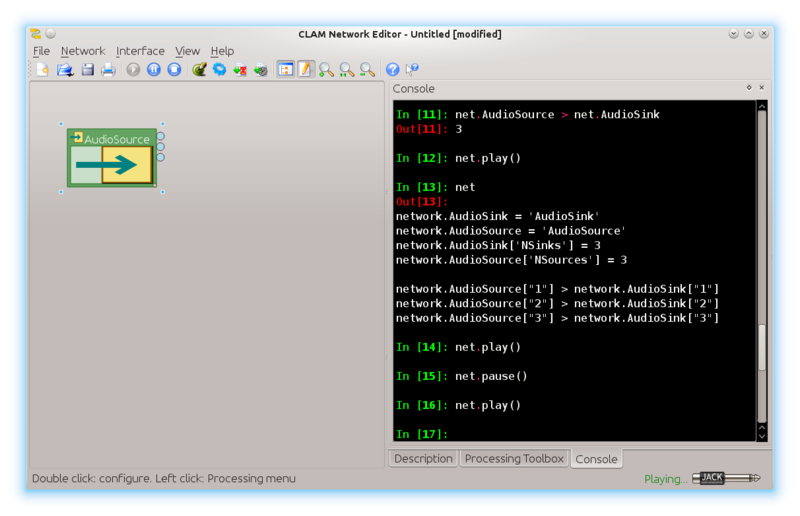 Yes, it is what it seems to be: A Qt-based IPython console embedded into CLAM NetworkEditor. Yes, ipyclam and NetworkEditor share the same network. And yes, sadly, although ipyclam sees anything we do in NetworkEditor. NetworkEditor does not refresh on ipyclam changes yet. After some days of trying stuff on Android exploring the feasibility of porting some CLAM based applications to the mobile phone, I must say I am pretty glad that yesterday Canonical has finally announced their Ubuntu Phone. Today’s command is not a command in itself but a package that enables installing whatever python package the Debian way, with a Debian package, even if there is no such package.